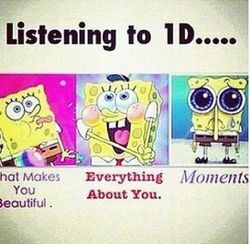 listening 2 1D. . Wallpaper and background images in the SpongeBob SquarePants club tagged: spongebob. This SpongeBob SquarePants photo might contain anime, comic kitabu, manga, cartoon, and mkono. That's what I'm calling a friendly face! "Cleanliness is inayofuata to managerliness." "You like Krabby Patties don't wewe Squidward!" posted zaidi ya mwaka mmoja uliopita. Lyrics for the Song in "To upendo A Patty"
wewe Like Krabby Patties Dont wewe Squidward!